A map of the moon... should be in every geological lecture room; for no where can we have a more complete or more magnificent illustration of volcanic operations. Our sublimest volcanoes would rank among the smaller lunar eminences; and our Etnas are but spitting furnaces. 'On the Volcanoes of the Moon', American Journal of Science, 1846, 2 (2nd Series), 347. Anaximander the Milesian, a disciple of Thales, first dared to draw the inhabited world on a tablet; after him Hecataeus the Milesian, a much-travelled man, made the map more accurate, so that it became a source of wonder. Agathemerus 1.1. In G. S. Kirk, J. E. Raven and M. Schofield (eds. ), The Presocratic Philosophers: A Critical History with a Selection of Texts (1983), p. 104. But as Geographers use to place Seas upon that place of the Globe which they know not: so chronologers, who are near of kin to them, use to blot out ages past, which they know not. They drown those Countries which they know not: These with cruel pen kill the times they heard not of, and deny which they know not. Prae-Adamitae (1655), trans. Men Before Adam (1656), 164, published anonymously. Concerned to reconstruct past ideas, historians must approach the generation that held them as the anthropologist approaches an alien culture. They must, that is, be prepared at the start to find that natives speak a different language and map experience into different categories from those they themselves bring from home. And they must take as their object the discovery of those categories and the assimilation of the corresponding language. 'Revisiting Planck', Historical Studies in the Physical Sciences (1984), 14, 246. Fragments of the natural method must be sought with the greatest care. This is the first and last desideratum among botanists. All taxa show relationships on all sides like the countries on a map of the world. Philosophia Botanica (1751), aphorism 77. Trans. Frans A. Stafleu, Linnaeus and the Linnaeans: The Spreading of their Ideas in Systematic Botany, 1735-1789 (1971), 45. I used to say the evening that I developed the first x-ray photograph I took of insulin in 1935 was the most exciting moment of my life. But the Saturday afternoon in late July 1969, when we realized that the insulin electron density map was interpretable, runs that moment very close. 'X-rays and the Structure of Insulin', British Medical Journal (1971), 4, 449. Science and Sanity: An Introduction to Non-Aristotelian Systems and General Semantics (1958), 61. In natural history, great discovery often requires a map to a hidden mine filled with gems then easily gathered by conventional tools, not a shiny new space-age machine for penetrating previously inaccessible worlds. 'Mathematics and History', Mathematical Intelligencer (1992), 4, No. 4, 10. My interest in science was excited at age nine by an article on astronomy in National Geographic; the author was Donald Menzel of the Harvard Observatory. For the next few years, I regularly made star maps and snuck out at night to make observations from a locust tree in our back yard. In Wilhelm Odelberg (ed. ), Les Prix Nobel. The Nobel Prizes 1986 (1987). No paleogeographic map is worth the paper on which it is printed unless it depicts the actual state of affairs for a limited geologic time, say several hundred thousand years. As quoted in Adolph Knopf, 'Charles Schuchert: 1858-1942)', National Academy Biographical Memoir (1952), Vol. 28, 372. Science is the art of the appropriate approximation. While the flat earth model is usually spoken of with derision it is still widely used. Flat maps, either in atlases or road maps, use the flat earth model as an approximation to the more complicated shape. In 'On the Nature of Science', Physics in Canada (Jan/Feb 2007), 63, No. 1, 13. Scientific research was much like prospecting: you went out and you hunted, armed with your maps and instruments, but in the ened your preparations did not matter, or even your intuition. You needed your luck, and whatever benefits accrued to the diligent, through sheer, grinding hard work. Sir,—The Planet [Neptune] whose position you marked out actually exists. On the day on which your letter reached me, I found a star of the eighth magnitude, which was not recorded in the excellent map designed by Dr. Bremiker, containing the twenty-first hour of the collection published by the Royal Academy of Berlin. The observation of the succeeding day showed it to be the Planet of which we were in quest. Letter, from Berlin (25 Sep 1846). In John Pringle Nichol, The Planet Neptune: An Exposition and History (1848), 89. Galle thus confirmed the existence of the planet Neptune, found at the position predicted in a letter he had just received from Urbain Le Verrier. Tait once urged the advantage of Quaternions on Cayley (who never used them), saying: “You know Quaternions are just like a pocket-map.” “That may be,” replied Cayley, “but you’ve got to take it out of your pocket, and unfold it, before it’s of any use.” And he dismissed the subject with a smile. In Life of Lord Kelvin (1910), 1137. The first concept of continental drift first came to me as far back as 1910, when considering the map of the world, under the direct impression produced by the congruence of the coast lines on either side of the Atlantic. At first I did not pay attention to the ideas because I regarded it as improbable. In the fall of 1911, I came quite accidentally upon a synoptic report in which I learned for the first time of palaeontological evidence for a former land bridge between Brazil and Africa. As a result I undertook a cursory examination of relevant research in the fields of geology and palaeontology, and this provided immediately such weighty corroboration that a conviction of the fundamental soundness of the idea took root in my mind. In The Origins of Continents and Oceans (4th ed. 1929), trans. John Biram (1966), 1. From 'Study of Thomas Hardy', in Edward D. McDonald (ed. ), Phoenix: The Posthumous Papers of D.H. Lawrence (1936). Excerpted in Selected Critical Writings (1998), 20. The principles of Geology like those of geometry must begin at a point, through two or more of which the Geometrician draws a line and by thus proceeding from point to point, and from line to line, he constructs a map, and so proceeding from local to gen maps, and finally to a map of the world. Geometricians founded the science of Geography, on which is based that of Geology. Abstract View of Geology, page proofs of unpublished work, Department of Geology, University of Oxford, 1. The theory of probability is the only mathematical tool available to help map the unknown and the uncontrollable. It is fortunate that this tool, while tricky, is extraordinarily powerful and convenient. The Fractal Geometry of Nature (1977, 1983), 201. The views of the Earth are really beautiful. If you’ve ever seen a space IMAX movie, that’s really what it looks like. I wish I’d had more time just to sit and look out the window with a map, but our science program kept us very busy in the lab most of the time. Theory provides the maps that turn an uncoordinated set of experiments or computer simulations into a cumulative exploration. This theme of mutually invisible life at widely differing scales bears an important implication for the ‘culture wars’ that supposedly now envelop our universities and our intellectual discourse in general ... One side of this false dichotomy features the postmodern relativists who argue that all culturally bound modes of perception must be equally valid, and that no factual truth therefore exists. The other side includes the benighted, old-fashioned realists who insist that flies truly have two wings, and that Shakespeare really did mean what he thought he was saying. The principle of scaling provides a resolution for the false parts of this silly dichotomy. Facts are facts and cannot be denied by any rational being. (Often, facts are also not at all easy to determine or specify–but this question raises different issues for another time.) Facts, however, may also be highly scale dependent–and the perceptions of one world may have no validity or expression in the domain of another. The one-page map of Maine cannot recognize the separate boulders of Acadia, but both provide equally valid representations of a factual coastline. Today there remain but a few small areas on the world’s map unmarked by explorers’ trails. 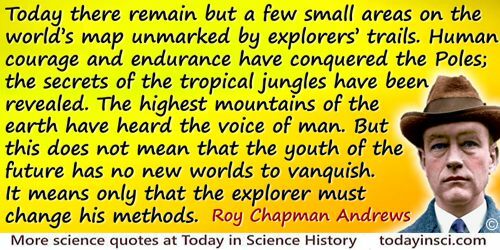 Human courage and endurance have conquered the Poles; the secrets of the tropical jungles have been revealed. The highest mountains of the earth have heard the voice of man. But this does not mean that the youth of the future has no new worlds to vanquish. It means only that the explorer must change his methods. On the Trail of Ancient Man (1926), 5. Two important characteristics of maps should be noticed. A map is not the territory it represents, but, if correct, it has a similar structure to the territory, which accounts for its usefulness. ... If we reflect upon our languages, we find at best they must be considered only as maps. Science and Sanity: An Introduction to Non-Aristotelian Systems and General Semantics (1958), 58. 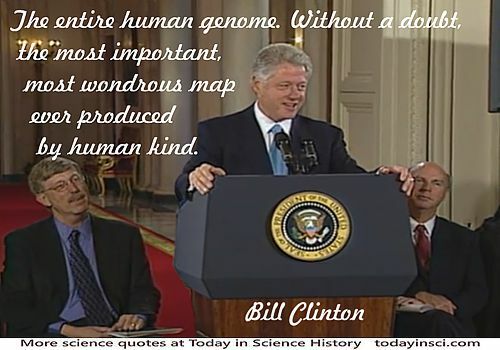 We are here to celebrate the completion of the first survey of the entire human genome. Without a doubt, this is the most important, most wondrous map ever produced by human kind. We are like the explorers of a great continent, who have penetrated its margins in most points of the compass and have mapped the major mountain chains and rivers. There are still innumerable details to fill in, but the endless horizons no longer exist. Stating his belief that within a generation or two, scientific progress was likely to halt. In Presidential Address (28 Dec 1970) to the American Association for the Advancement of Science. 'Science: Endless Horizons or Golden Age? ', Science (8 Jan 1971), 171, No. 3866, 24. Quoted in obituary by Douglas Martin, New York Times (20 Jan 2005). We started out by giving away [our maps and guides], and it was the wrong principle. The day I found a Michelin guide book used to prop up a wobbly table, we put a price on them. What are the sciences but maps of universal laws; and universal laws but the channels of universal power; and universal power but the outgoings of a supreme universal mind? The Metaphysical Magazine. Vol III: January 1896–June 1896 (1896), following title page. With the unlocking of the atom, mankind crossed one of the great watersheds of history. We have entered uncharted lands. The maps of strategy and diplomacy by which we guided ourselves until yesterday no longer reveal the way. Fusion and fission revolutionized the whole foundation of human affairs. In a speech to the General Federation of Women’s Clubs, Philadelphia, Pennsylvania, May 24, 1955. Yes, gentlemen, give me the map of any country, its configuration, its climate, its waters, its winds, and the whole of its physical geography; give me its natural productions, its flora, its zoology, &c., and I pledge myself to tell you, a priori, what will be the quality of man in history:—not accidentally, but necessarily; not at any particular epoch, but in all; in short, —what idea he is called to represent. Introduction to the History of Philosophy (1832), trans. by Henning Gotfried Linberg, 240.